If you’re on my Instagram, you’d be most familiar with my love for food and my #EatatChezPB hashtag. I’m a foodie, always seeking out new and interesting places to eat, but I also cook. In recent times, I’ve decided to incorporate a little more of that interest, because that’s who I am. Hence, “Eat at Chez PB” – “Eat at PB’s house”. No, that’s not quite a literal invitation LOL! A few years ago, I used to marry these two interests in a weekly food segment. I dropped it for various reasons, time being chief among them. But I’ve decided to bring it back in a slightly more irregular fashion with a focus on food I cook, not food I eat. Eat at Chez PB is my domestic side that potters about the kitchen, and spends hours eyeing kitchen gadgets and cookware, dreaming more of that perfect kitchen, than the perfect beauty room. I cook, but I’m no Masterchef. I chiefly do simple dishes and meals, often for 1-2 persons, but scalable to feed more if desired. MWS is a beauty blog, but I’m sure you realise by now that it has more aspects to it than mere beauty. Eat at Chez PB reflects that. I also operate off a guesstimate method of cooking, as a lot of cooking depends on your personal tastes and preferences. I again, make no apologies for this. Often, using more or less of any ingredient doesn’t really matter – this isn’t baking, which is an exact science. It’s cooking – cook from your heart, and to your taste, not someone else’s. To kick off, here’s a fairly simple dish I have modified over time to make it very easy, and importantly, tasty. 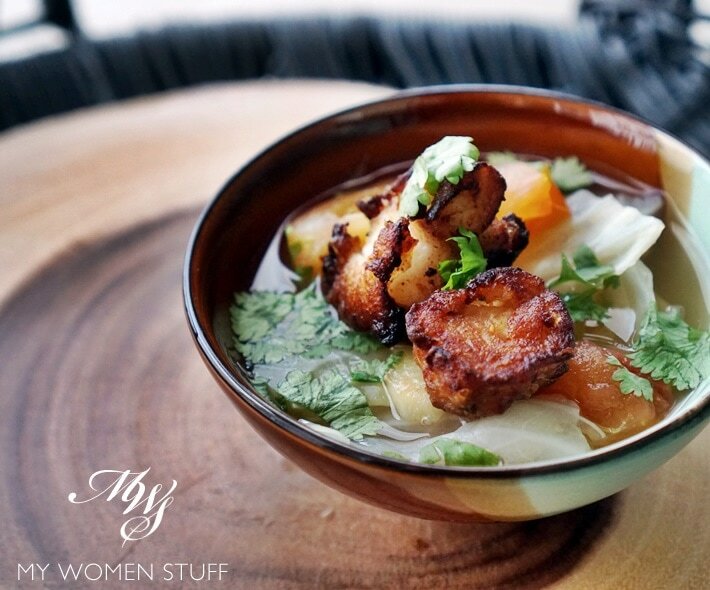 This is a version of clear Asian style Fish Soup that you can have on its own, or with rice or noodles as you wish. Those who are familiar may wonder if this is a variation of Fish Head Noodles (Yu Tau Mai) a local popular hawker favourite. It is, but not quite although you can use this as a base to turn it into your variation of Fish Head Noodles. The flavours in fish head noodles tend to be stronger, while this is a milder, clearer version. I prefer to pan-fry the fish separately instead of cooking it in the soup, as I’m not a fan of the fishy taste that accompanies soups like that, and the texture of the fish afterwards. Also, this seasoning I use to pan-fry the fish will, I promise you, kill that fishy taste and smell associated with eating fish, especially if it’s a stronger tasting, oilier fish. I also prefer using boneless chunks of meat, because it’s just easier to eat, and the seasoning penetrates each small piece better than a large slice of fish. I suggest using a white fish, which has a milder taste and sweeter flavour. Examples from our local fish market are garoupa/grouper (kerapu) or snapper (ikan merah or jenahak). But oilier fish like mackerel (tenggiri or batang fish) work as well. I wouldn’t use salmon (I’m not a fan of it unless in sashimi) or cod simply because it’s too expensive locally. So work with what you have available locally. I actually came up with this seasoning to mask the fishiness of oilier fish, especially after they’ve been kept in the freezer a little while. What you will get, is a fairly clear tasting soup from the dried anchovy (ikan bilis) stock, with a hint of sourness from the fresh tomatoes, and sweetness from the cabbage. You may opt to use other vegetables instead, and the flavour will adjust accordingly. I suggest cabbage or Chinese cabbage (Napa cabbage), as it will sweeten the soup further, and you can cook it a while. Green leafy vegetables will wilt very quickly but may be added by blanching it quickly in the stock. 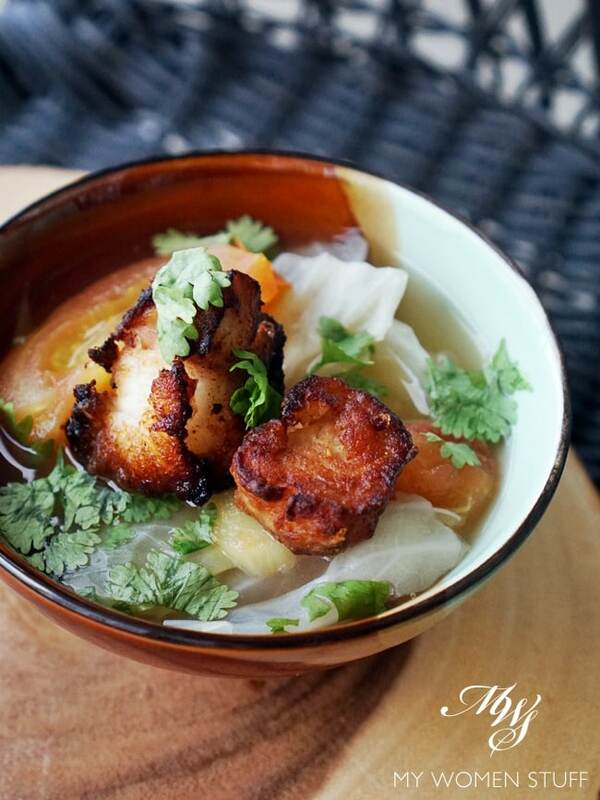 A simple version of a clear Asian fish soup with pan-fried fish, that you can have on its own or with rice or noodles. Place the dried anchovies in a stock bag, and sliced ginger into a pot of water and put to boil. This forms your stock. You will need to boil it for about 15-20 minutes. Prepare your fish. If your fish comes with bone in remove the meat from the bones. Place bones in stock for added flavour. Season the fish meat with the seasoning mix to your preference. The Chinese wine is optional, but if you can use it, it really helps to mask the fishy taste if you're sensitive. Use only very little sesame oil as it can be overpowering. Leave aside for about 10 minutes. Heat oil in a pan and pan-fry fish until brown on both sides. Remove and drain and set aside. After about 15-20 minutes of boiling the stock, remove the dried anchovies and any fish bones you have in it. Add the tomatoes, cut into segments and cabbage and boil until soft. If using Chinese parsley/Cilantro, add the cut stalks and leaves at this stage. Add a dash of soy sauce (or salt) and pepper to taste. If having with noodles, cook the noodles separately and ladle the hot soup over, place fish on top. If having with rice, you can do the same and have rice in soup, or serve it separately. Do you make a fish soup like this or a variation of it? Any suggested modifications that work? PREVIOUS POST: Your Say: Has NARS Cosmetics’ decision to sell in China affected your perception of the brand? This is awesome!!! I have been making this noodle soup based on the recipe you shared years ago over instagram and it’s a hit everytime. And I totally agree with the Nigella Lawson’s style of cooking too. Not all of us have the Masterchef ability but hey, we are not in competition with anybody right. Just be yourself and do keep on sharing ok. I like the Chinese milky fish soup. It was weird putting milk in the soup, but the result was well worth it. I usually ask for it to be omitted from my soup actually LOL! I don’t like the taste of it in my soup. I’m told that the original method is to boil fish bones till the soup becomes milky (as it will) but it’s a lot of work. Have you tried making it at home? I made a more robust fish noodles soup for the family the other day, and it was quite a success! I actually tried making the milky fish soup at home using a vietnamese recipe I found online. It needs to be eaten fresh and while still hot. It has a unique flavour which I am not averse to, but might not make it to my weekly menu. Still, an interesting flavour, gives me another option when I feel like having soup. I can imagine the many hours the original method would take. In this day and age, everything needs to be now now now. So let’s add milk LOL. 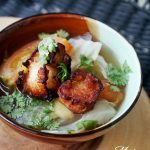 Ive never tried cooking a fish soup let alone an Asian fish soup (really different to the European soups Im used to – Polish people love a good hearty soup) so I will have to give it a go because it just looks so darn delicious! I do have a question though – where can I get a stock bag? Can I improvise somehow? Haha we can’t all do everything! And you’re good at what you can do 😉 The hardest thing about this will be frying the fish. The rest is a cinch! When I return home I will try it, right now I’m living in a Chinese influenced area so I’ve tried more “oriental” dishes. It’s interesting that you use tomatoes and leave them like that most soups in Mexico have tomatoes but they’re blended so you get a red soup. I’d have never thought of doing the fish apart but it looks delicious and my main doubt is: why you don’t cook the noodles in the same stock? Also I agree with your cuisine style if it has to be fried it’ll be fried, the biggest variations I do in recipes is to avoid dairy because of my sister and maybe reduce the amount of sugar but if I don’t get a tasty food when doing some changes I’ll prefer the original version. Same here – cooking is so unique because it is done purely to our own tastes. My salt tolerance is low, so my foods can sometimes come across as undersalted, because I don’t use a lot of salt in my cooking. I do use soy sauce which I think adds a little more flavour. But I always say there’s no right or wrong way to cooking (there is when you bake, but not really, when you cook) so just enjoy yourself! And I think it’s great that more people are cooking at home these days. Nothing beats making your own food 😀 Well, except for the damn clean up LOL! Oh do you enjoy oriental food? I think it’s great that you’re expanding your taste palate 😀 I have been wanting to explore more Mexican food, but locally, we don’t have many good Mexican restaurants and those that exist are really expensive. But I’m still trying, and I had some really good fish tacos a few months ago. I’ve only had tacos twice in my life so far! Enjoy them tremendously and I really want to try making them, except it probably won’t be very authentic since I’m not sure of the authentic taste! LOL! I shouldn’t be proud of this but actually when I bake I follow instructions but at the same time I do things by instinct and add more flour, sugar, etc. I’ve had some fails but most of my experiments have been good and tasty. But yes cooking is super personal and if you like it, it’s ok; in fact watching some shows I feel they’re too snobs, yesterday I saw Masterchef Junior and they criticise a boy who used sriracha in his lobster dish. I understand that for many it can be a sin, like for example me complaining about hard shell tacos but at the end I think we need to see if it was tasty. It’s complicated because food is a representation of culture so it can be a sensitive subject, same situation when we compare it with art. I’m living with a Chinese descendant family in the south of Mexico, the grand is 3rd generation Chinese from her grandfather so they don’t have a lot of Chinese influence but when cooking they use soy sauce, ginger, noodles (rice and wheat), rice and sriracha so yes it’s different from home but at the same time it isn’t completely Chinese. I’ll look for Mexican recipes that you can do without many specific condiments, because I understand that they aren’t easily available; I think that it was only recent years that you could find rice noodles in some supermarkets. If we all followed recipes to the letter, it’d be so boring! And there’d be no innovation. I don’t see anything wrong with adding sriracha to lobster! They should come and eat our chilli crabs/lobster – crustaceans smothered in a spicy chilli sauce LOL! I bought a bottle of taco seasoning recently off iherb. Now I just have to figure out what to do with it! LOL!